You can control whose visits are tracked in your Crazy Egg Snapshots by blocking IP addresses. For example, if you have traffic generated by employees, it’s difficult to distinguish visits and clicks from your visitors versus those visits from your own employees. To prevent internal traffic from diluting your data, you can block IP addresses. Go to Options in the left navigation. Add the IP addresses that you want to block to the list. That’s it, you have now successfully blocked IP addresses from your reporting data so that you get the most accurate results possible. Note: If you only need to block your own traffic, navigate to the section that says Add my current IP address and click on Add. Exclude at the Snapshot level if you want to exclude visits to only specific snapshots. Note: Currently only IPv4 is supported. Single IP AddressEnter individual IP addresses you’d like excluded. This is the most commonly used method of entering IP addresses. Wildcard IP AddressThis option is helpful if your IP addresses have some type of pattern but are not in consecutive order. You can enter the IP address and replace the section of the IP address that changes with an asterisk (*). 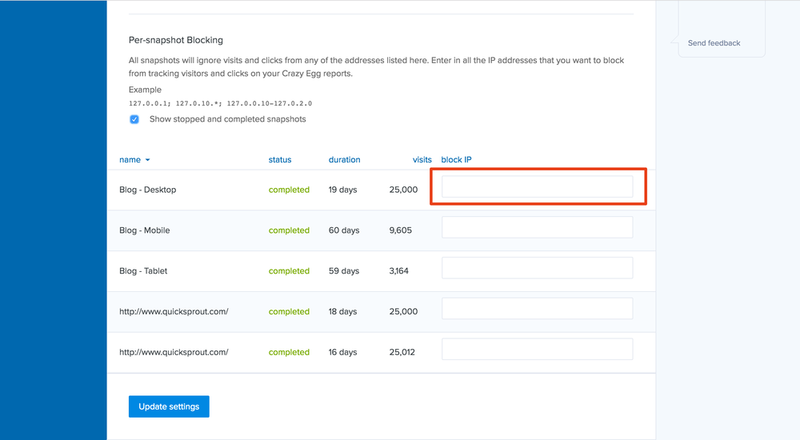 Using the range option makes excluding a large set of IP addresses that are in consecutive order easy. This saves you the trouble of entering each IP address or adding multiple wildcard IP addresses.